Last weekend, we visited campus to attend the swim team’s final home meet for the season. Before leaving for our trip, I went through my treasured recipes to prepare a few baked favorites for all three children. M’s favorite is a no-brainier… She loves Old Fashioned Baked Oatmeal. I usually make her a 9×13″ pan, cut into squares and packaged in an airtight container. I’m told she usually skips the dorm breakfast and opts for a big bowl of plain yogurt paired with a crumbled square of my baked oatmeal. P is more of a junk food kinda kid. He loves plain ole’ chocolate chip cookies. I usually make Chocolate Chip Cake Mix Cookies. I’m told he shares them with floor mates and friends so I usually try to make a rather large batch for sharing. Who can resist a batch of freshly baked cookies? K is a mix between the two when it comes to choosing a favorite baked item. Her care package contained a batch of Nutella Granola bars. For this easy bar, all of the ingredients are combined and pressed into a 13×9″ baking dish. They are then sliced and wrapped individually for freshness and portability. The bars are full of good hearty carbs and are sweetened by combining Nutella with peanut butter and honey. 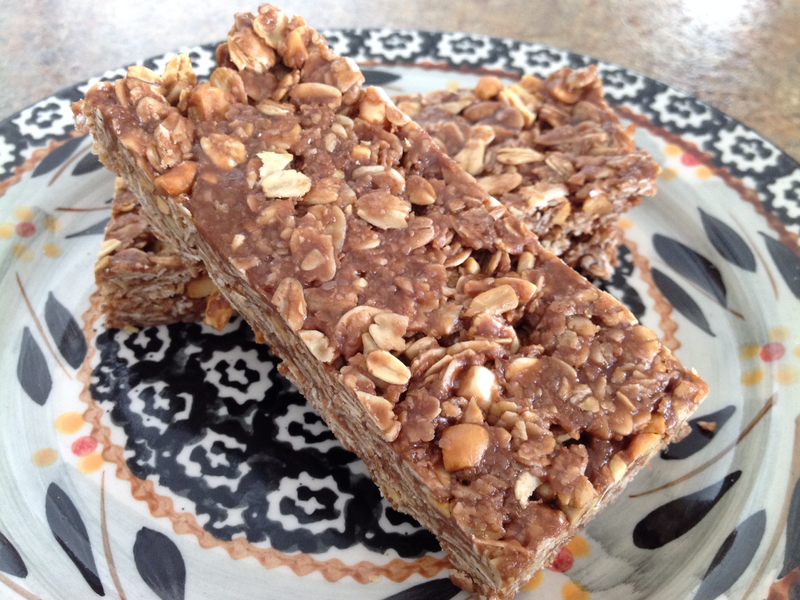 This is a great no-bake recipe that can be prepared in a jiffy. 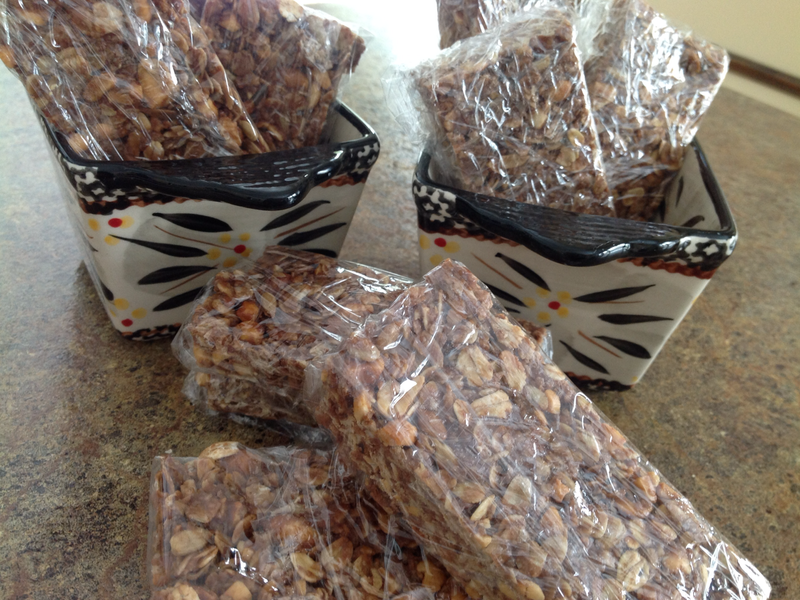 Make sure to individually wrap the bars to keep them fresh and pliable. Preheat oven to 400°. In a jelly roll pan, pour oats, peanuts, wheat germ and sunflower kernels. Mix thoroughly and bake for 8-12 minutes or until lightly toasted, stirring occasionally. Remove from the oven and cool on a wire rack. Transfer to a large bowl. In a small saucepan, combine honey, brown sugar and butter. Cook and stir over medium heat until mixture comes to a boil; cook 2 minutes longer. Remove from heat; stir in peanut butter and Nutella until blended. Add the warm honey mixture to the dry, toasted ingredients and toss to coat. Press into a greased 13×9″ pan. Cool. Cut into bars. Wrap individually with plastic wrap. Store in an air-tight container. I agree, Nutella can be quite expensive. Even the “knock off” brands are pricey. One consolation, there isn’t a whole lot of Nutella in the recipe. A little goes a long way… Thanks for your comment! Stay warm! Looks like a must try recipe. I just put Nutella on my shopping list. Thanks for sharing! My kids and hubby will love these. Nutella, check! Glad to hear it, Shanna! I hope all is well with you and your lovely family. I’m sure you’ve got your hands full these days… Take Care! Anyway, I’m trying to add some variety to their breakfast routine, and this recipe sounds like a winner. Will gratefully and enthusiastically try it! Oh my goodness, that’s so funny! I have a son that seems to feel that throwing empty bottles and wrappers behind his bed is the norm. Maybe our kids should get together! Thanks for your valued comment. I’ve been looking for a granola recipe to try and I think this is it. Nutella?? Oh yes. I’ve been looking for a granola recipe to try and I think this is it! Nutella?!? Um, yes! Haha! I’m with you, sister! It’s a good one! Yummy! Living in Italy, there is so much Nutella I think we could drown in it! Sadly, peanut butter is virtually impossible to find. I kind of wish it was the other way round! When I am next in the UK I will stock up on PB and give your lovely recipe a try! Just a suggestion… We make our own peanut butter with jars of peanuts or bulk bags of peanuts. Just drop the peanuts into a powerful blender (we use a Ninja blender) and process until smooth. Store in an airtight container in the fridge and enjoy! They never disappoint! I hope you have a chance to try them… they’re really easy to make. 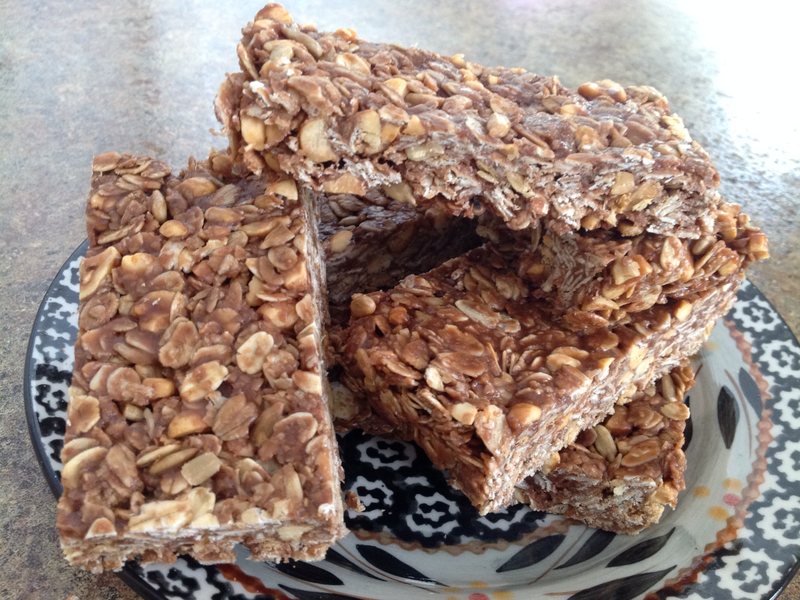 These look fantastic…from the pictures, it looks like there are oats in the bars, but I did not see oats in the ingredient list, or the directions.